Thailand’s prime minister, Prayuth Chan-o-cha, reshuffled his Cabinet Thursday in a bid to quell anxieties about the government’s failure to stimulate the economy just days after the country experienced its worst ever terrorist attack. The cabinet reshuffle – expected for months and ceremonially approved by King Bhumibol Adulyadej – saw the introduction of 11 new faces as well as the shifting of nine current ministers to different portfolios. 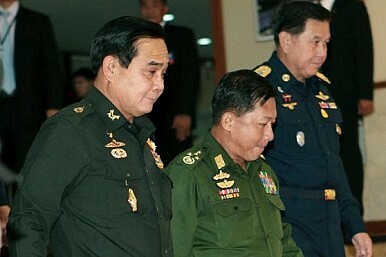 It also saw the addition of two more army generals, despite earlier suggestions from Prayuth that this would not occur. Ahead of the reshuffle, government spokesman Sansern Kaewkamnerd confirmed that the changes were necessary given the challenges the ruling junta has faced since assuming power in a coup last May. As expected, the most significant change was the installation of Somkid Jatusripitak as deputy prime minister and head of the economic team. Somkid, a former finance minister, replaces Pridiyathorn Devakula, a former Central Bank governor. Dissatisfaction about the running of economic policy under Pridiyathorn’s tenure was well known. Other economic portfolios were affected as well. Apisak Tantivorawong, former president of the state-owned Krung Thai Bank, replaced Sommai Phasee as finance minister. There were also changes at other economics-related ministries, including commerce, agriculture and industry. The reshuffle comes amid deep economic and political uncertainty. The ruling junta has struggled to get the country’s economy off the ground amid flat exports, low private investment and a weak baht. A deadly bomb blast at a popular Bangkok shrine, which killed 20 people, is expected to only make things worse, especially since tourism accounts for about a tenth of Thai economic output (See: “What’s Behind Thailand’s Deadly Bomb Blast?”). Politically, a timetable for a transition back to democracy continues to slip. The government has already hinted that elections, which have already been repeatedly postponed, may be put off again until 2017 if a new charter is not approved next month (See: “When Will Thailand Hold Its Election?”). While the recent attack may buy the ruling junta some time, the patience of its opponents may soon be wearing thin, raising the possibility of renewed violence between supporters of the establishment and those of former prime minister Yingluck Shinawatra. Apart from the cabinet reshuffle, Thailand will also undergo its annual military reshuffle in September, which will bring the retirement and promotion of officers. Will Thailand's Military Be Held Accountable for the Country's Economic Woes?US-Thailand Relations on a Razor’s EdgeA New Era of Intolerance in Thailand?Thailand's New Constitution: A Threat to Religious Freedom?Thailand's New Constitution: A Blow to Rights?